Whether you need to play a different advert, jingle or travel report on your local/regional transmitters, or even a different programme online while your local FM service carries the local sports game: AdSplits is the solution. It is expected that the software (and help file) will be updated regularly over the next few weeks – if you are trying the software, please ensure you’re running the latest version before sending a report/question. This software is designed for stations of a particular size/infastructure so is priced as such. Cost is “per Master” NOT per split, from £250 (subject to station/market size, anticipated split numbers etc). Price based on station size – please contact me with details of your station and playout software. AdSplits offers unlimited split feeds per licence/workstation – Whether you just want to separate your DAB+FM transmitters, or split to 6 feeds during a network show: It’s easy to assign control and see what’s happening. The only limit is the number of audio outputs on the splits computer. This is the actual player which reacts to control commands sent to it from “Master”. The audio system allows you to use a 7.1 surround-sound device in multi-speaker mode giving you 3x stereo outputs (ie: 3 splits) on a cheap “domestic” card. A main “advert log” playlist and 3 “instant” players are provided. In order to add more split services, just make a copy of the AdSplitsClient.exe and rename it to match the name of the split service, eg: FM East.exe. This creates a separate config file which you edit to match that service’s audio/path settings. A simple SPLIT GO is all that’s needed as a single playlist item in your studio to start an unlimited number of splits. A “Master” can accept incoming control commands from multiple studios allowing a single computer to manage incoming split commands from 3 studios each having their own split/transmitter destinations. The flexibility of this means that only a single “START ADS” macro needs to be defined in your playout system no matter how many (or which) split/s you are controlling – very useful if a studio regularly networks to different services. 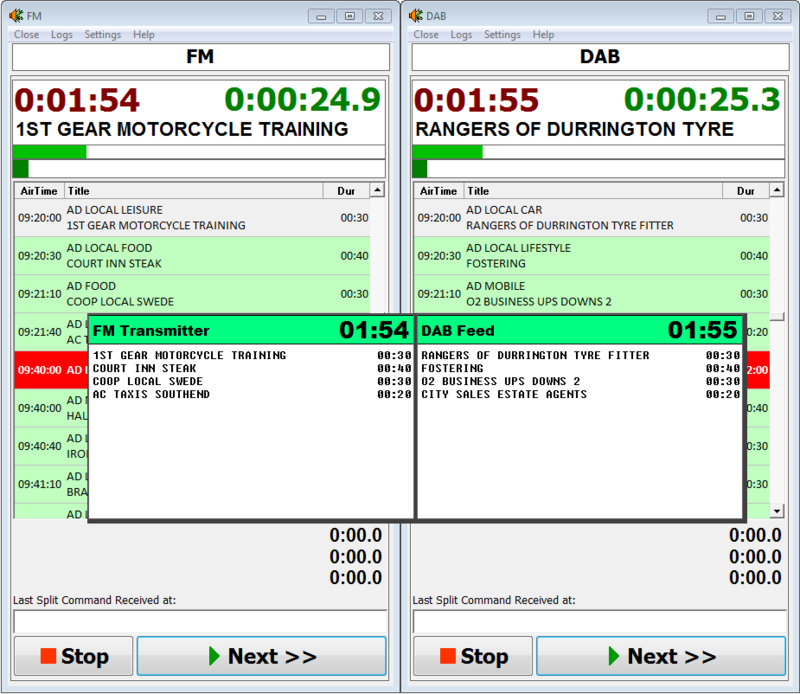 In the above example, each studio can launch a :58 advert-break with studios 2+3 “logging-off” from AdSplits Master allowing the presenter in studio 1 to take control of DAB, STREAM and FM East once the adverts have finished. Advert logs can be M3U files created via drag’n’drop or StationPlaylist Creator. The RS232/UDP protocol is open-source and detailed in the help file – this means that you can also make use of low-cost hardware to handle the “on-air” control between “Studio” and “Master” such as an Arduino or a Raspberry Pi. Timing information is offered “in studio” by SplitMon which is a free add-on and runs on any computer with network connectivity to the Splits machine. SplitMon displays a real-time countdown of each split plus x items or last item so you know how much content each split has left to play. SplitMon has a simple config screen to quickly change the splits being monitored – up to 8 “profiles” are supported each offering up to 20 remote-split monitors. This makes it ideal for studios that often drive different services/networks. The software is window-less and is “always on top” so can be overlayed with your playout software, clock screen or just run on a desktop machine. In-Use Video (updated 20th April) : Click here for a short MP4 video of SplitMon in action – this shows a refresh of playlist timings, an “instant” jingle (“news next”) plus an advert from the playlist before sync’ing the next break. With the additional of a special “notification script”, SplitMon can also display activity from mAirList players in real-time. Is a control application to handle routing of splits in a studio environment – You select the split “Master” and then its associated “Clients”. Once selected, any commands are then sent to the relevant splits. My SplitVT application also integrates with AdSplits “Master” and allows the split-destinations to auto-populate when selecting a “Master” within SplitVT.